This scrub sponge features a double-action design for easier and more efficient cleaning of pots and pans. Made of cellulose/synthetic fiber. The sponge side is full of long-lasting, hard-working detergent that quickly and efficiently removes grease and food particles. 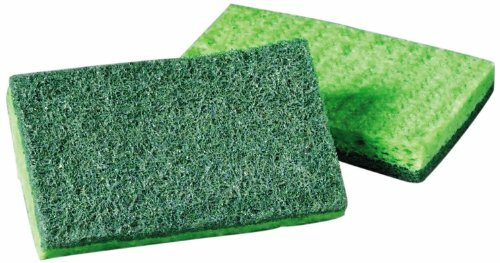 The Scotch-Brite general purpose scouring pad 96 material easily scours away heavy grime and won't sliver, rust or stain like steel wool pads. Green/Dark Green color. Mineral abrasive. Measures 3-3/4" length by 2-3/8" width.